The notion that the leadership baton of the global economy will pass from the US to China or the EU is just wishful thinking. Instead, it is the baton of economic followership that the other big economic players have grabbed. The US economic leadership is immutable and should it eventually give, which it eventually will during the 5th Kondratieff Wave, the current global order will crumble. Neither China, Japan nor the EU, specifically Germany, is in a position to assume the mantle of global leadership because they are all current-account (CA) surplus countries. The bigger their economies become, the more problems they create for the rest of the world. 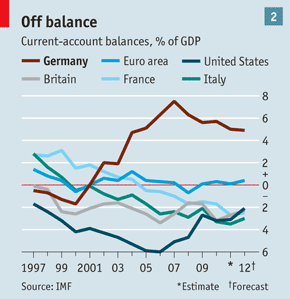 Take Germany, the economic problems of the southern European countries can be traced to Germany's preoccupation with maintaining continual current account surpluses since the formation of the eurozone on 1st January 1999 (see The Economist chart at left). 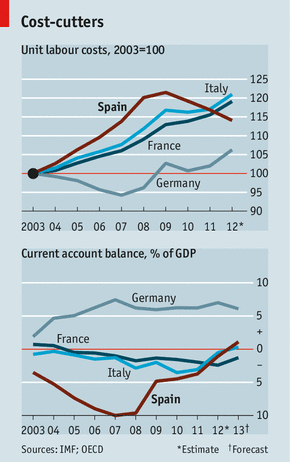 Notice that prior to the eurozone, most of the other euro countries were having CA surpluses. An updated chart from the recent issue of The Economist shows that Germany is still fixated with these damaging CA surpluses. The others can't match Germany's economic prowess because their labour productivity is inferior. This can't be redressed without an adjustment in exchange rates or drastic salary cuts. For example, Spain and Italy are expected to turn their deficits into a surplus this year but at the expense of substantial cutbacks in consumption. What's the purpose of saving when starving is the price paid? As long as the euro exists, it will drive the EU into the ground. Germany can't get rid of its CA surpluses because its 2009 constitutional amendment requires the federal and state governments to maintain balanced budgets. Even its soccer clubs has a licensing system that ensures their fiscal prudence. Germany is perplexed that others can't emulate its financial discipline, so through its economic clout, it is imposing this discipline on others. But by doing so it's tightening its own noose. Its CA surpluses will soon diminish once other EU nations have to reduce their CA deficits. Without the benefits of the CA surpluses, Germany's balanced budget restraint will unravel but that can't be undone without flouting its constitution. So expect Germany to face a long slog to an uncertain future.